We are excited to announce the official launch of our newest product – the fully non-combustible Euroclass A1 rated sheathing board, Siniat Weather Defence. Siniat Weather Defence is a lightweight external gypsum sheathing board with condensation management properties for building envelope construction that is suitable for almost all facades. 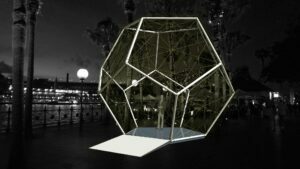 The product is deemed non-combustible in accordance with C1.9e (i) and (iii) and can be installed on frame for up to 12 months construction exposure. Siniat is 30% lighter compared to cement particle board of the same thickness and the Weather Defence innovation is resistant to mould, rain and moisture, acting as a breather membrane, while also making the building watertight for internal trades. For further information on Siniat please visit our product page. To see how Weather Defence can benefit your next project please contact our team by live chat on our website or call us on 1800 007 175. 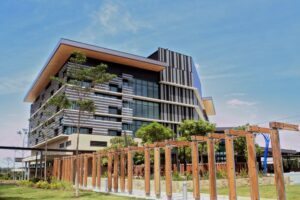 The NSW Forensic Pathology and Coroner’s Court has relocated from Glebe to a new world-class facility in Lidcombe. 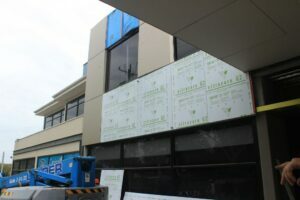 The new facility in Sydney’s Greater West was constructed by WATPAC and opened in December 2018. Fairview’s deemed-to-satisfy non-combustible Vitracore G2 panels were chosen to achieve the unique exterior as designed by Silver Thomas Hanley. The design features vertical fins with pyramid details in five complementary finishes – Fresh Green, Pure White, Cool Grey from Fairview standard range and custom colours, Bechett and Irish Moore. 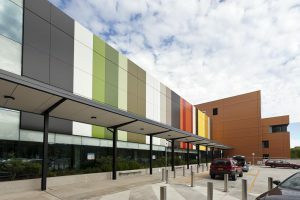 Vitracore G2 is a popular choice for infrastructure projects and has previously been used on a number of similar projects including the Department of Human Services, Moore Theological College, and Monash House Private Hospital. In addition to being BCA compliant, the high-performance panel has the adaptability to be bent and folded into various shapes enabling architects to achieve compliancy without sacrificing their design. 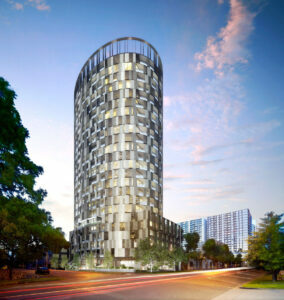 Eastern Sydney’s newest addition is the stunning mixed-use development, Encore. 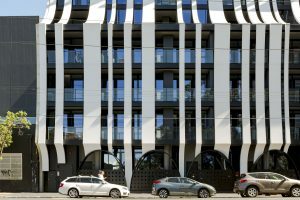 The collaboration of Stargate Property Group and award-winning architectural practice, MHN Design Union, offers retail space and sustainable residential apartments on bustling Oxford Street, Bondi Junction. The project began with the redevelopment of the existing two storey façade into a three storey podium that aligns with the street. 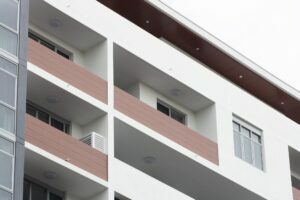 The modern frontage was achieved through the use of Fairview’s natural stone cladding system, Vitrastone, in Pale Sandstone on the first two floors. 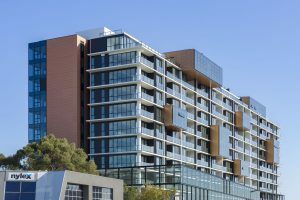 The podium on level three features Fairview’s deemed to satisfy non-combustible aluminium cladding Vitracore G2, in the popular Brushed Copper finish; with all products expertly installed by the team at JJP Group. The development’s eleven storey’s of innovative residential apartments then tower behind, providing occupants with spectacular views from every angle. The chequered pattern design of the construction combines additional use of Vitracore G2, this time in Frost White, Monument Grey and Cool Grey. 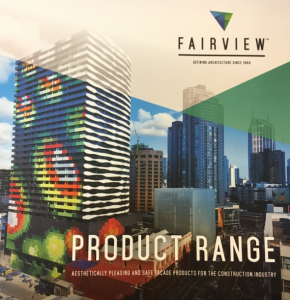 For more information about using Fairview’s products on your next project please contact our team by phoning 1800 007 175, email helpdesk@fv.com.au or take advantage of our online forms. 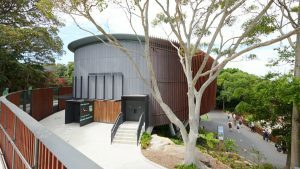 With a combination of unique natural texture, colour and surface, Equitone’s fibre cement cladding sheet Tectiva was an obvious choice for the Tanner Kibble Denton Architects designed Taronga Centenary Theatre. 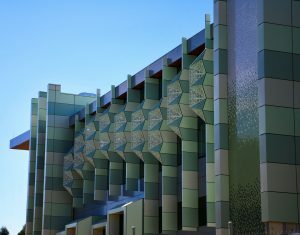 Given the leafy setting of Sydney’s Taronga Zoo, the colour tones of the theatre’s façade needed to be sympathetic to the surroundings. Equitone’s TE20 through-coloured finished Tectiva with its sanded surface and naturally occurring hues achieved just that. 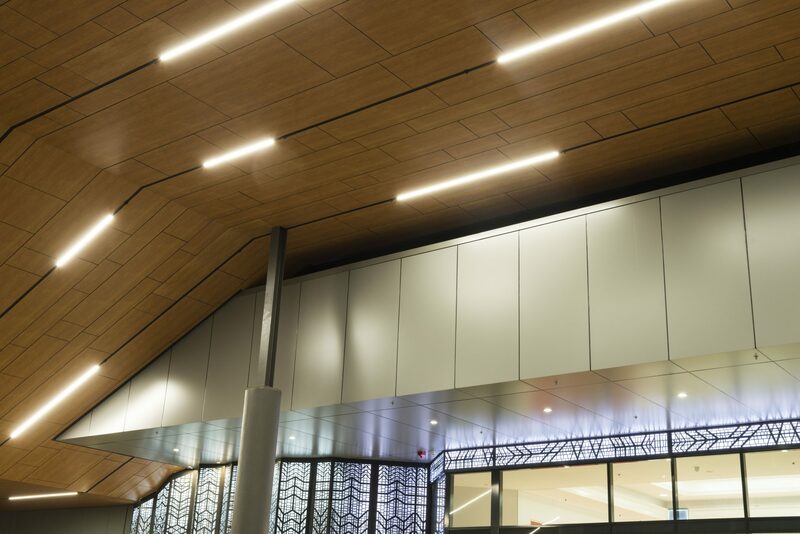 At a thickness of 8mm, Tectiva offers high durability with an incredible longevity but remains light enough to allow for fast and easy installation. The product’s waterproof shield not only protects but enhances the natural warmth of the rough unpolished fibre cement. 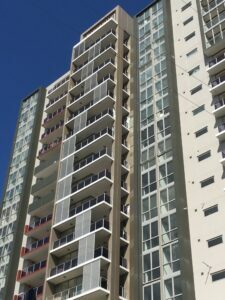 Other benefits of Tectiva and Equitone’s other products are their non-combustibility and environmentally-friendliness. Find out more about Tectiva or any other Equitone product by contacting our team on 1800 007 175 or by email helpdesk@fv.com.au. Fairview is pleased to announce the creation of a new Innovation Team under the leadership of Greg Stewart. 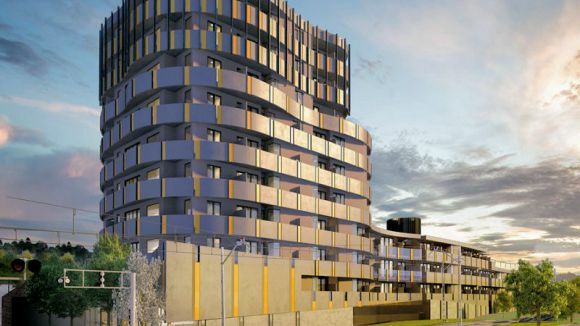 The new team will drive and maintain Fairview’s strong position as an educator and thought leader, bringing to market façade systems that define and improve the safety, performance and appearance of architectural buildings within the Australian construction industry. The Innovation Team is responsible for examining issues relating to compliance and regulatory change as well as the management, testing and development of new products. This will ensure Fairview’s product portfolio remains at the forefront of the market. 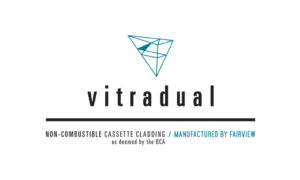 The Company has a strong reputation for delivering safe and aesthetically pleasing façade solutions to the industry, including the revolutionary deemed-to-satisfy, non-combustible aluminium panel, Vitracore G2 and the fully non-combustible 3mm solid aluminium solution, Vitradual. Ashley How, Technical Manager- Ashley is Fairview’s well-known and highly experienced technical manager. He is an integral part of the team and responsible for addressing non-standard applications and providing customized solutions to our customers with knowledge gained through ongoing product research and development. 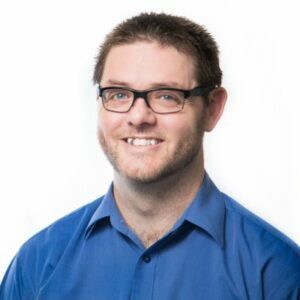 Roy Gillies, National Product Manager – as Fairview’s former Queensland Business Development Manager, Roy excels at understanding client needs and consistently leads the company’s successful delivery of innovative façade systems. 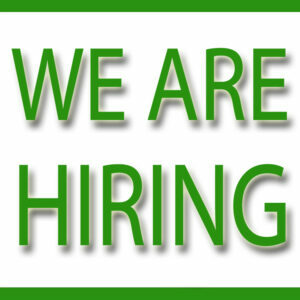 The Innovation Team can be contacted directly at innovation@fv.com.au or by contacting 1800 007 175. 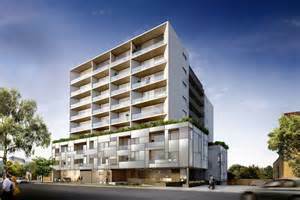 Set on the bustling Maroondah Highway in Melbourne’s outer eastern suburb of Ringwood is the notable Evelyn Ringwood Apartments. 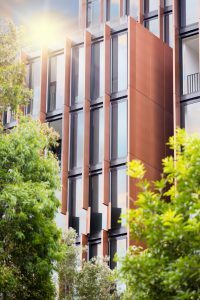 The boutique mid-rise development is clad in vertical panels of Stryüm Shadow, providing a modern and sustainable exterior to the mixed-use development. 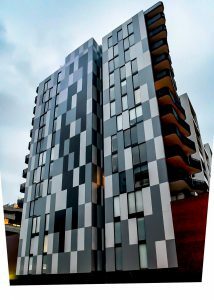 Consisting of 45 apartments over 6 floors, including 1 level of commercial space, Idle Architecture Studio in conjunction with B Central Constructions have produced a unique gridded façade where the stylish yet simple design of Stryüm Shadow compliments the distinct aluminium window frames and vertical landscape elements. 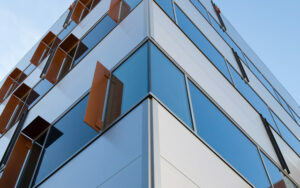 The design also deflects heat and moisture due to the ventilated rainscreen. 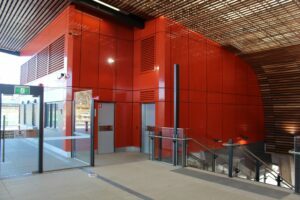 The Australian-made, non-combustible aluminium panels were a well-considered design choice that additionally provide a high durability and are easy to maintain. Stryüm was specifically designed by experienced commercial façade professionals to meet the demands of Australia’s construction industry. To speak with our team about using Stryüm on your next project phone 1800 007 175 or email helpdesk@fv.com.au . Recladding is a major issue currently facing the construction industry following the occurrence of several building fires around the world caused by the use of non-compliant building materials. 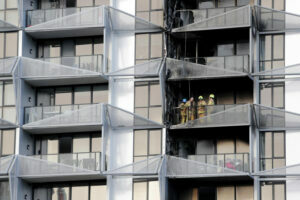 It is estimated that thousands of square metres of non-compliant cladding may need to be replaced on commercial buildings throughout Australia and authorities across the country are carrying out audits to identify buildings at risk. 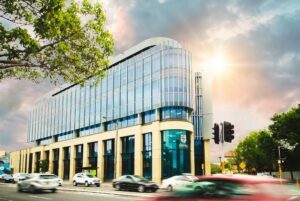 As a leading provider of safe façade cladding products, Fairview are at the forefront of providing advice, expertise and solutions to building owners, architects, engineers, builders and other industry professionals who are navigating their way through this issue. If you are concerned about your façade, or have a building that has been identified as needing to be reclad, please get in touch with us via email: helpdesk@fv.com.au or phone 1800 007 175. 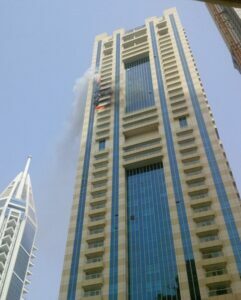 You can also find more information on recladding here>. 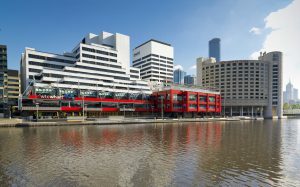 We have officially launched a new Melbourne office located in the recently refurbished, and idyllically located, Tower 4 of the World Trade Centre on the banks of the Yarra River. 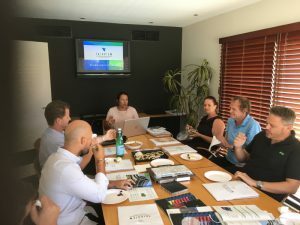 The office is home to our Victorian based team, offering a hub to meet with state-wide architects, builders and installers to plan and manage current and future projects. 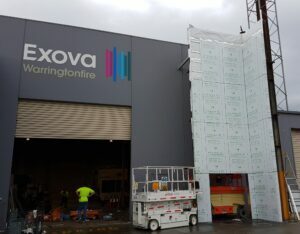 Opening a permanent base in Melbourne follows our rapid growth and expansion in the area, and the increasing popularity of our range of non-combustible and deemed non-combustible façade cladding solutions. 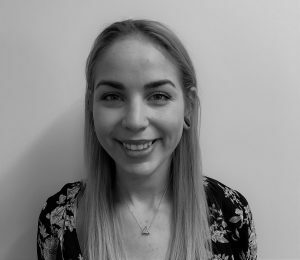 We also recently recruited a new architectural representative, Melissa Herrmann, who is based in the Melbourne office. 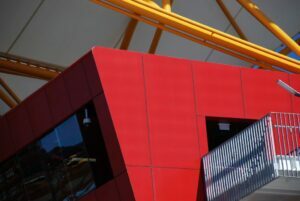 With expertise spanning over 30 years in the building and construction industry, we have established a reputation as an industry leader within the façade solutions arena. 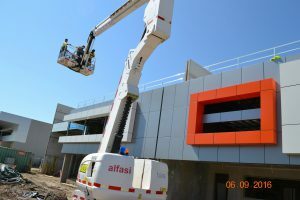 The appointment of new staff, opening of new offices in Sydney and now Melbourne as well as acquisition of new product ranges is testament to the commitment of providing aesthetically pleasing and safe façade products to the construction industry. For enquiries on our product range, or to speak with one of our team members please email phone 02 6352 2355 or email helpdesk@fv.com.au. 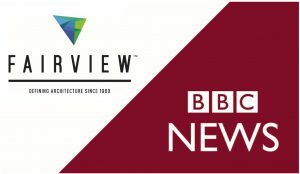 Fairview is pleased to announce a new CPD presentation for architects and builders, “What you need to know about ACM Cladding”, which focusses on developing a comprehensive understanding of the ACM cladding products widely used on construction projects. 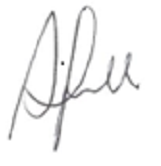 The course also provides information on the different types of construction where ACM products are typically specified. Fairview also offers the formal CPD presentation “Should I Worry About My Façade” that is facilitated by the internationally renowned Technical Director of Red Fire Engineers, Jonathan Barnett. 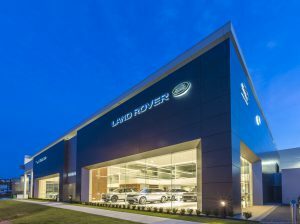 The Queensland beachside suburb of Southport recently became home to one of the state’s newest luxury car dealerships, Jaguar Land Rover, which features 950m2 of Fairview’s Vitracore G2. The $9 million project was officially launched with a glitzy, star studded event throughout the 3-storey showroom. Architect Burling Brown designed the high-end project, constructed by builder Stokes Wheeler. 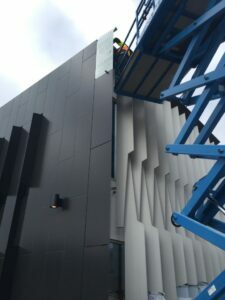 Damien Popovic of Cladding Creations installed Vitracore G2 panels on the façade in custom Jaguar Land Rover corporate colours Sunshine Grey Metallic and Champagne Metallic. The monumental corner block structure offers an enviable luxury car showroom floor, customer lounge as well as a vehicle workshop and on-site parking. Project Manager Jai Johnson was completely satisfied with the Vitracore G2, stating ‘The project required customised lengths, up to 5900mm, which proved to be completely within Vitracore G2’s capabilities. In contrast to previous projects using standard composite materials, no oil canning or bending is visible on the cladding panels – a testament to their rigidity and strength. 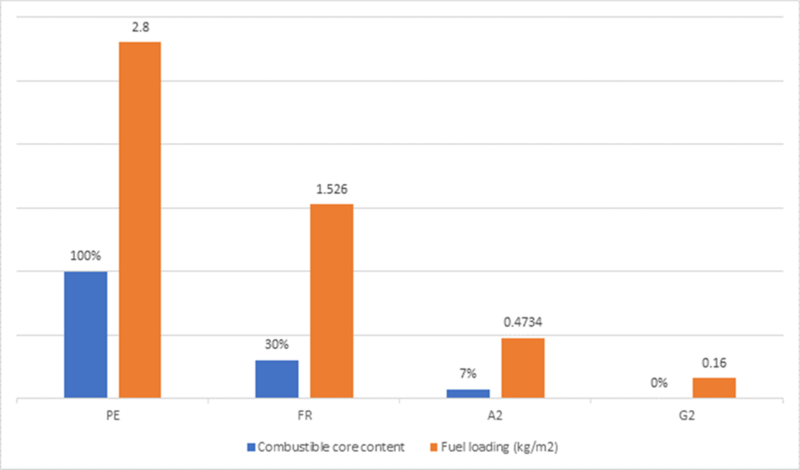 Another bonus for Stokes Wheeler is that Vitracore G2 complies with current BCA requirements’. For more information about using Vitracore G2 please contact our team by phoning 02 6352 2355 or email helpdesk@fv.com.au. 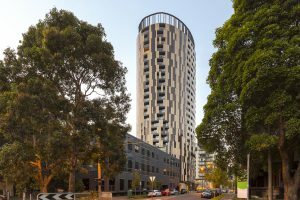 The copper-toned star of Sydney’s Central Park urban development, Connor Apartments, which boasts 10,500m2 of Fairview’s fire retardant Vitrabond, has been awarded winner of the 2017 Urban Development Institute of Australia’s Award for Excellence in High-Density Development in NSW. 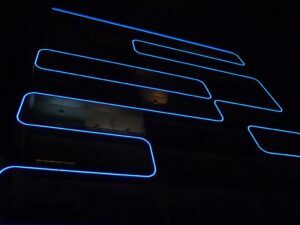 Located just 1.5km from Sydney CBD, architect William Smart of Smart Design Studio, designed the 13-storey eye-catching cornerstone of the precinct as a “delicate balance of form, composition and proportion.” Comprising of 178 apartments, complete with 5 Star Green Star credentials, the optically pleasing façade of Connor is adorned in a combination of reflective glass and the sheen of a metal finish on aluminium composite cladding. Installed by Shev Constructions Pty Ltd, the contemporary project features weather resistant Vitrabond FR panels in “Brushed Copper” (10,000m2) and “Satin Black Metallic” (500m2), which were chosen as a nod to the warm red bricks in the local area whilst also creating an urban contrast of metal against green parklands. For more information, take a look at the Project News. 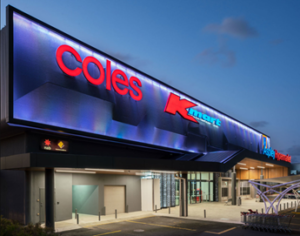 Kane Constructions were this month awarded the 2017 Master Builders Association of New South Wales Excellence in Construction of Tertiary Buildings $30M – $40M for their work on the Moore College Resource and Research Centre project in Newtown NSW, which features 2000m2 of Vitracore G2. Officially opened in February 2017, the 7,800m2 college was designed by Allen Jack + Cottier Architects and houses Moore College Library, the largest theological library in the Southern Hemisphere. 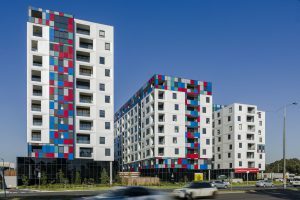 BJL Roofing & Facades installed Fairview’s Vitracore G2 in “Sparkling Dark Grey Metallic” and the custom colour “Titanium Silver” which accentuate the glass façade of the developments standout corner block. Take a look at our Moore Theological College Project News for more information. Vitracore G2 is highly effective for infrastructure projects such as schools and was a sound choice given the recent news that our Deemed-to-Satisfy non-combustible cladding panel successfully passed the official full-scale facade test requirements of BS8414 and BRE 135, the current, globally recognised standard for full-scale cladding facade tests in Australia. 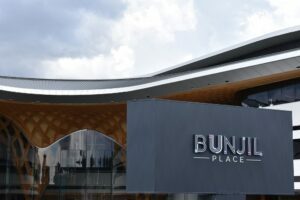 Melbourne’s south-east city of Casey recently launched the $125 million state-of-the-art Bunjil Place entertainment precinct, featuring 2200m2 of Fairview’s Vitrabond FR and Vitracore G2 aluminium composite cladding. 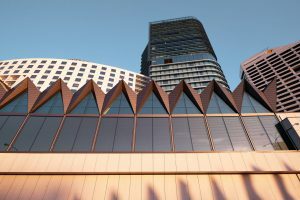 One of the largest projects undertaken by local government in Australia, the striking 24,500m2 building, designed by Francis-Jones Morehen Thorp architects is a national first with the innovative design incorporating 10 functional spaces including an 800-seat theatre, a 350-seat versatile function centre plus a community library and art gallery. The vision for the centre’s expected 1 million visitors per year, was “to create an inviting central heart for the community that celebrates participation, belonging and civic pride.” The Vitrabond FR and Vitracore G2 cladding panels in “Brushed Silver” shimmer over the curved glass façade and winged roof providing visitors with an insta-perfect sight. Further information on the project can be found in our Project News. 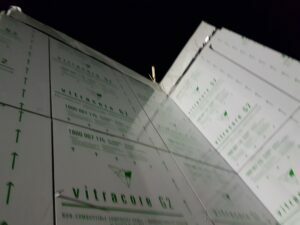 As announced last week, Vitracore G2 is currently the only aluminium composite panel available in Australia that is correctly tested as having satisfied the requirements of the following industry standards: AS 1530.1 and AS 1503.3 as well as full scale façade testing; BS8414 and BRE 135 as well as AS5113 (excluding the debris requirements). 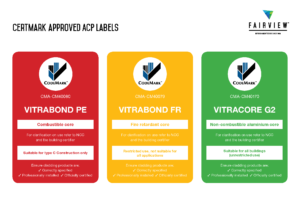 Fairview – in partnership with CertMart – is launching a new packaging initiative to further assist people to correctly identify and use ACM panel types. 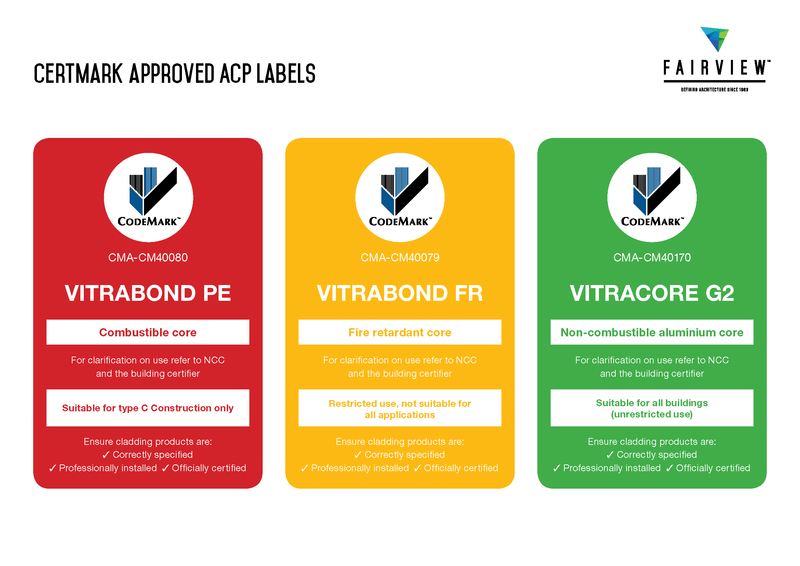 While our current panels do feature inkjet identification stencils on each panel, all Fairview ACM panels will soon feature striking new red, amber or green labels clearly reinforcing panel types and suggested usage. CertMark CEO John Thorpe said: “This is a timely and effective initiative by CertMark and Fairview to ensure each panel has a definition of the core material and the applicable class of building the panel can be installed on”. 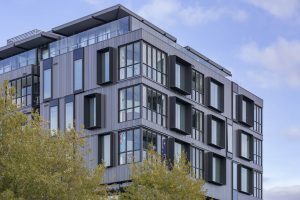 During our 30 years’ in the façade cladding industry, we have developed many solutions to help architects and their designs stand out from the crowd. 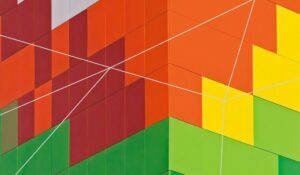 Colour is often the key and, following customer demand, we are today launching two new colour charts featuring our full range of Solid and Metallic colour finishes for external façade panels. The colour charts provide an easy way for customers to find the colour they are looking for or to simply explore the possibilities and find fresh inspiration. A key feature of the charts and, of particular benefit to specifiers, is that all colours are clearly marked as ‘MOQs’ (Minimum Order Quantities) and ‘No MOQs’ to ensure that this information is made available prior to choosing a colour for a particular project. 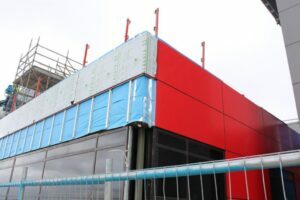 All of the colours that appear in the charts are available on our popular external cladding panels: Vitrabond, Vitracore G2 (DtS Deemed non-combustible) and Vitradual and can also be used as a guide for Trimo and Ceramapanel. 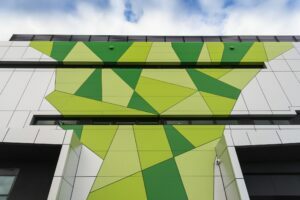 In addition to colour swatches, the charts also include examples of projects where specific colours have been used such as the iconic Swanston Square in Melbourne which features a staggering 18 solid colour finishes. 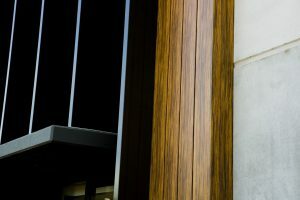 At the moment, Metallic colours are proving a popular choice for external façade finishes as they can be either bright and cheerful or sombre and traditional. The Fairview Metallic Colour Chart has an extensive range of colours including “Gold Metallic” which is on track to become the company’s “2016 Colour of the Year”. “We pride ourselves on listening to our customers and giving them what they need to make their projects successful. I am delighted that we have developed a series of colour charts that showcase our full range of colours in an attractive and easy to use format,” commented Fairview CEO, Andrew Gillies. The new colour charts are available to download from our website (Solid Colours and Metallic Colours) and hard copies are also available on request. 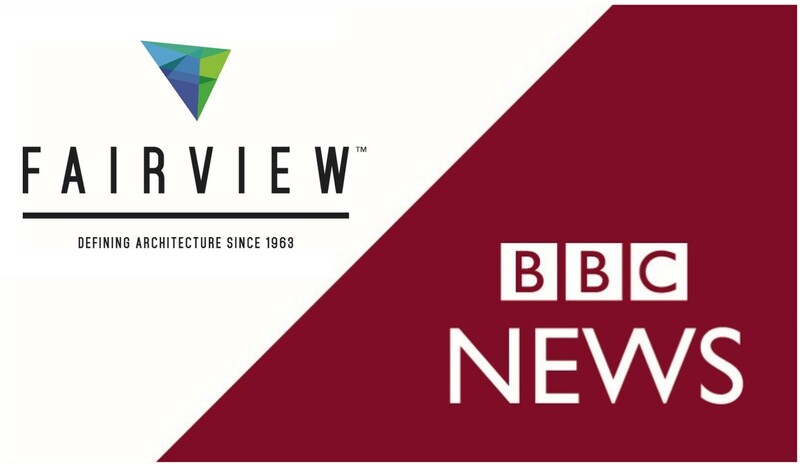 In addition to the colour charts, we also recently launched our BIM catalogue, another initiative designed to help architects to easily incorporate our popular cladding products directly into a BIM project design. If facades could predict the state of Australia’s economy then we would be predicting that things are looking bright at the moment, in fact you could say they are golden. And by golden we mean literally the colour gold. So, what is the data to back up this theory? 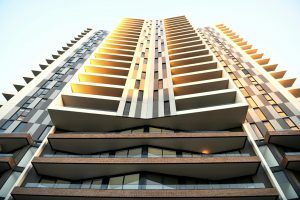 It’s pretty simple: architects are specifying more gold façade panels than ever before. 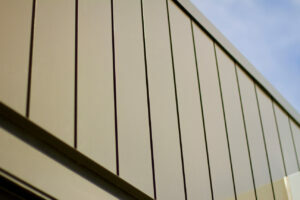 Over the last few months we have seen “Gold Metallic” ranking as the No.1 façade colour of choice. So, why is gold so popular? Well, if you want your design to convey; extravagance, wealth and riches then gold is the perfect colour choice. As a precious metal it also signifies wealth, grandeur, and prosperity. All that in just one colour! 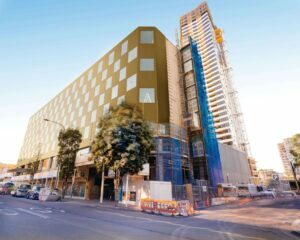 We first noticed this trend when we supplied over 3,000m2 of “Gold Metallic” to Infinity for use on the Parkroyal Hotel, Parramatta extension earlier this year (see case study for more information). Since then we have seen the popularity of this colour grow. 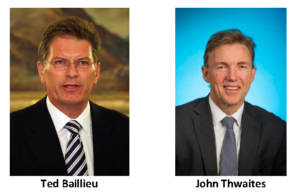 With over 30 year’s experience in the industry, we’ve not seen a gold rush like this before and, although we are not economic experts, we’ll stand by our prediction that this could be a good sign for the economy, or at the least, a reflection of the growth rate we are seeing here at Fairview!